St Leonard’s is a beautiful church in a beautiful place. It stands high and proud above the town of Hythe, looking towards the coast of France, which can be easily seen on a clear day. Thousands of visitors pass through its doors every year, and enjoy the magnificent architecture and extraordinary crypt. 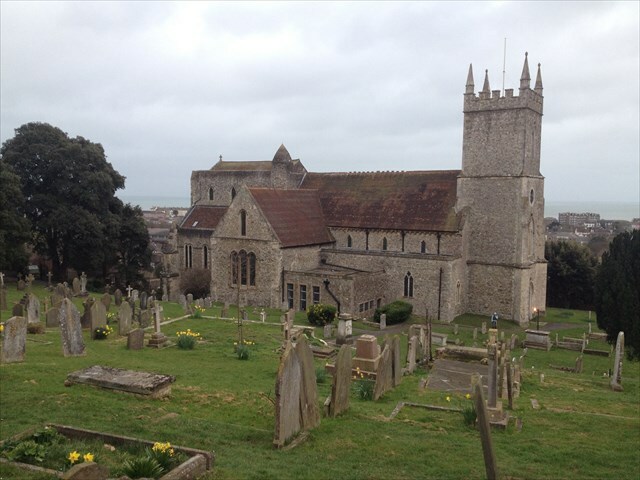 The crypt of St Leonard’s Church in Hythe contains one of only two ossuaries in the UK (the other is in Rothwell, Northants). It holds over 2,000 skulls arranged neatly along the walls and 8,000 bones in a huge pile stacked almost to the ceiling - like a macabre game of Jenga. When death is such a taboo these days it’s a shock to see so much of it staring you in the face. There have been many theories about how such a large collection got here – as the result of a Saxon battle or a wave of the Black Death. The mostly likely explanation is less dramatic, simply that an existing burial ground was disturbed during the building of the new church in the 13th Century. Now to the cache, its a little stroll around the church and the church yard to find some info, if you find them in order below it will take you on a walk anti clockwise and you will need to visit the grave yard extention to find one grave only there..